Claimed to be ‘the frankest and most honest portrait of Paul Weller ever written’, The Changing Man is a new biography of Paul Weller by Paolo Hewitt – and it’s set for release by Bantam Press on 24th September 2007 in hardback for around £18.99. 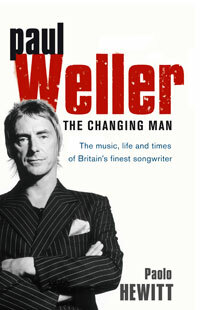 It’s said to be a twist on the typical biography (thankfully – there’s plenty of those around about PW), mixing Hewitt’s knowledge of Weller and his music making with an examination of Weller’s lyrics – selecting the key songs as a tool to explore the man’s character, as well as a few personal anecdotes to add a bit more depth and uniqueness to the book. Note that this isn’t to be confused with Suburban 100, the Weller lyrics book that is also due out in September with a Peter Blake sleeve. Although it could well cover similar ground.